Last night, we were hit with the unfortunate news that former UFC middleweight title challenger Yoel Romero had been forced out of the main event of UFC Fort Lauderdale with an illness. This left his opponent, Ronaldo “Jacare” Souza, without an opponent. According a report from Brazilian MMA news outlet Combate, the UFC has already found a new opponent for the man they call Jacare in streaking middleweight knockout artist Paulo Costa. This bout has not yet been officially confirmed by the UFC. Interestingly, Paulo Costa was the man originally expected to fight Yoel Romero at UFC Fort Lauderdale, but the Brazilian was forced off the card. Despite this earlier situation, it sounds as though he’s now back on the card. Costa will enter this fight with Jacare with a perfect 11-0 record. In his last fight, he weathered some early adversity to score a TKO win over Uriah Hall. His three most recent wins also occurred in the UFC’s Octagon, where he defeated former UFC welterweight champ Johny Hendricks, Oluwale Bamgbose, and Garreth McLellan. Jacare, on the other hand, is 26-6 in sum. The former Strikeforce middleweight champion last fought in November, when he knocked out former UFC middleweight champion Chris Weidman in a wild brawl. This victory separated him from a split decision loss to Kelvin Gastelum, who is set to battle Israel Adesanya for the interim middleweight title at UFC 236. 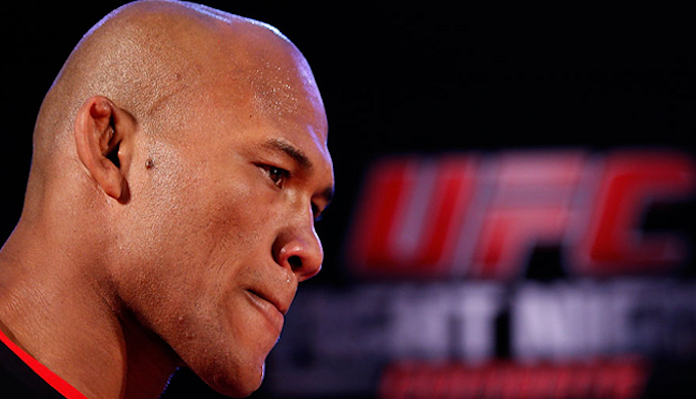 What do you think of this potential short-notice booking between Jacare Souza and Paulo Costa? Who do you think will come out on top? Make your predictions in the comments section below.